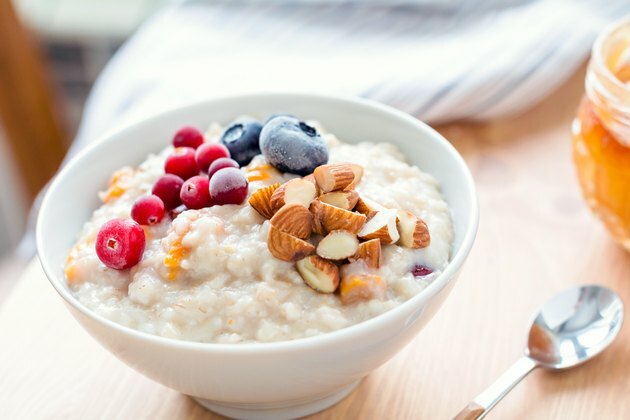 Oatmeal and cream of wheat, also known as farina, may really hit the spot on those cold mornings, but you may wonder if hot cereals fit into your low-carb diet. It really depends on your carb allowance and whether you want to spend them on one of these high-carb breakfasts. If you're having a hard time figuring out how to add oatmeal or cream of wheat to your low-carb diet, consult a registered dietitian to help you design a meal plan that suits your goals and needs. Oatmeal and cream of wheat aren't low-carb foods. Based on the standard serving sizes of each cereal, a 1/2-cup serving of dry oats has 27 grams of carbs, and 3 tablespoons of dry cream of wheat has 25 grams of carbs. How many carbs you're allowed to have may determine whether you can fit these carb-heavy cereals into your plan. Some low-carb plans start you out at 20 grams a day to jump-start the weight loss, which might make it hard to enjoy a big bowl of oatmeal. But on a more liberalized carb-restricted diet that allows up to 150 grams daily, these hot cereals may easily fit into your plan. Cream of wheat is made from whole-grain wheat, but to get the smooth texture, the cereal doesn't contain the bran or wheat kernel, which makes it a refined grain. Oatmeal, on the other hand, is a whole grain. Both cereals contain fiber, 4 grams in oatmeal and 1 gram in cream of wheat. If you're calculating your daily carbs using net carbs, which subtracts fiber from the total carbs, you may be able to shave a few carbs from your bowl of cereal. So, oatmeal has 23 grams of net carbs, and the regular, refined cream of wheat has 24 grams. But, you can swap out regular cream of wheat for whole grain kind, which has 19 grams of net carbs -- 23 total grams minus 4 grams of fiber -- per serving, to get more fiber and lower the net carb value. Though it might be tough to fit in oatmeal or cream of wheat on your 20-gram carb diet, if you're allowed around 60 grams a day, you should be able to include it. For example, at breakfast you might make your oatmeal with water or a low-carb liquid such as heavy cream or unflavored almond milk and mix in artificial sweeteners, cinnamon and four chopped almonds for a meal with 27 grams of carbs. Lighten your carb load at lunch to 18 grams with grilled chicken on top of 2 cups of mixed greens with Caesar dressing and 2 tablespoons of shaved parmesan cheese served with a cup of raspberries. A low-carb dinner of grilled salmon and a cup of steamed kale leaves you room to enjoy a small bowl of whole-grain cream of wheat made with 1½ tablespoons of the cereal, water and artificial sweetener for a snack. This snack has about 12 grams of carbs. Hot cereal may be your go-to breakfast, but there are a number of other breakfast meals you might enjoy that won't cost you as many carbs. An omelet stuffed with 1 ounce of Swiss cheese and 1/2 cup of cooked spinach with a couple of slices of bacon has only 2 grams of carbs. Make low-carb pancakes using a low-carb all-purpose baking mix to create pancakes with 3 grams of carb per cake, and sweeten by topping with 1/2 cup of halved strawberries, which have 6 grams of carbs. Add a 2-tablespoon dollop of heavy whipping cream, for 1 more gram, and your 2-pancake stack weighs in at 13 grams of carbs altogether. How Many Servings of Complex Carbohydrates Should You Eat a Day on a Low-Carb Diet?